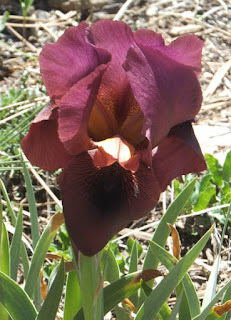 In my blog post this April about arilbred irises, I mentioned that these striking garden jewels come in all sizes. 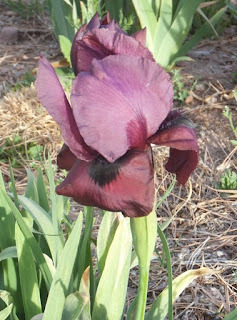 Today I'm going to focus in on the smaller arilbreds, which are often called arilbred medians. 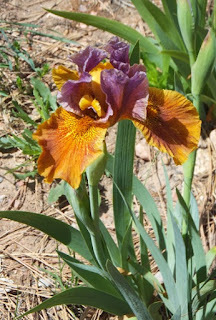 All arilbreds have in their ancestry both bearded irises and the exotic aril irises from the mountains and deserts of southwestern Asia. Because tall bearded irises have long been the most popular and extensively bred of the bearded types, it was mostly tall bearded irises that were used to produce arilbreds. 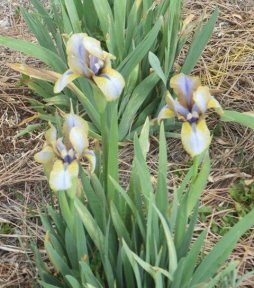 However, there have always been hybridizers of an adventurous bent who used dwarf or median bearded irises to produce arilbreds. 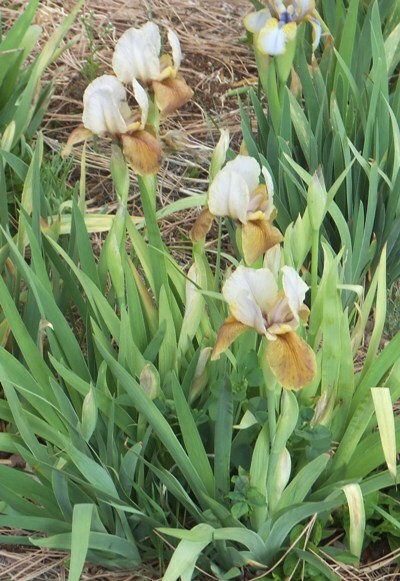 Among the first irises from such breeding is 'Zwanenburg' introduced by French hybridizer Louis Denis in 1912. 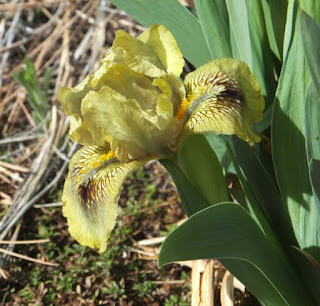 Its parentage is a matter of debate, but a dwarf bearded cultivar derived from Iris lutescens was one of the parents, and there is clearly aril ancestry as well. Remarkably, it is still being grown today! 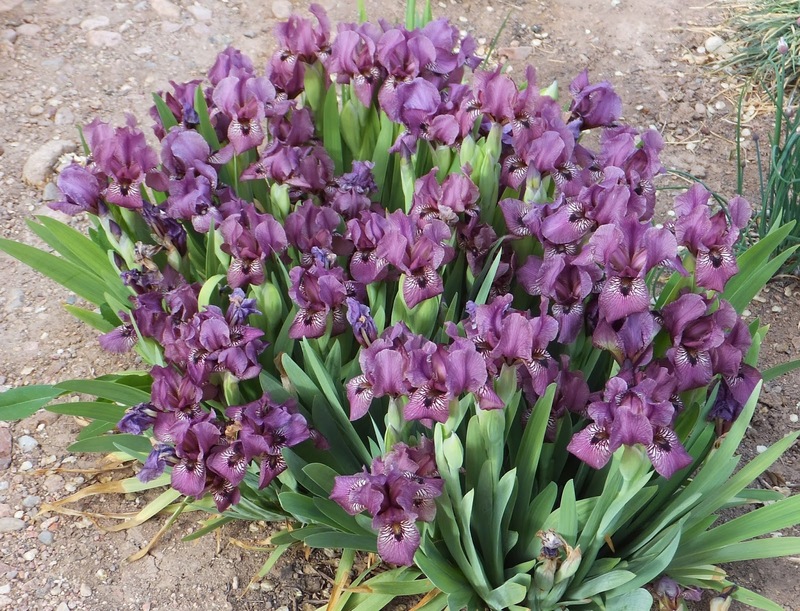 Its muted bronze and gray colors are not to everyone's liking, and the stalks and petals are rather flimsy, but it grows and blooms prolifically and has been delighting gardeners for over a century. In the middle of the 20th century, two developments occurred that paved the way for renewed interest in arilbred medians. The first was the development of the modern standard dwarf bearded irises (SDBs) from TBs crossed with the tiny dwarf species Iris pumila (see my blog post in July of this year here). The second was the creation of a "fertile family" of arilbreds from TB and aril breeding. Most earlier arilbreds had been quite sterile, which meant that new ones could only be created by working with the pure arils themselves, which are difficult to grow and breed with. 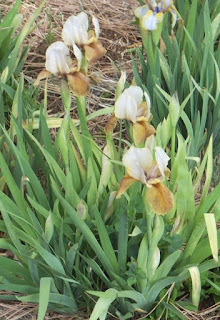 The new fertile arilbreds meant that it was now relatively easy to produce all sorts of new irises with aril ancestry. Since that time, crossing SDBs with fertile arilbreds has been the most common way to create arilbred medians. They vary a lot in height, but average around 18 inches high. These are only 1/4 aril, so often their aril characteristics are rather subtle. The best have obvious veining or a definite signal patch below the beard, and have a more globular flower form than do the intermediate bearded irises (IBs), which they otherwise resemble. Some small arilbreds were also produced by crossing SDBs or dwarf species directly with pure arils. Because they bypass the TB ancestry that comes in when using an arilbred parent, they are both smaller (averaging around 10 inches) and more aril-like. Most arilbred medians carry genes from three distinct types of irises: arils, tall bearded, and dwarf bearded (usually Iris pumila), making them one of the most genetically rich types of irises you can grow. They really do have it all! 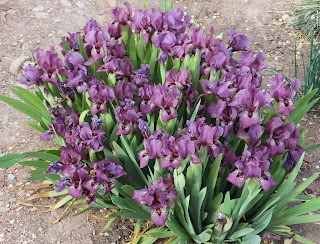 This genetic diversity expresses itself in a wide range of colors and patterns, a wide range in height and garden uses, and adaptability to a range of climates. Their dwarf ancestry helps many of them deal with cool rainy climates better than the taller arilbreds, and conversely their aril ancestry helps them do better in mild-winter climates than the SDBs. 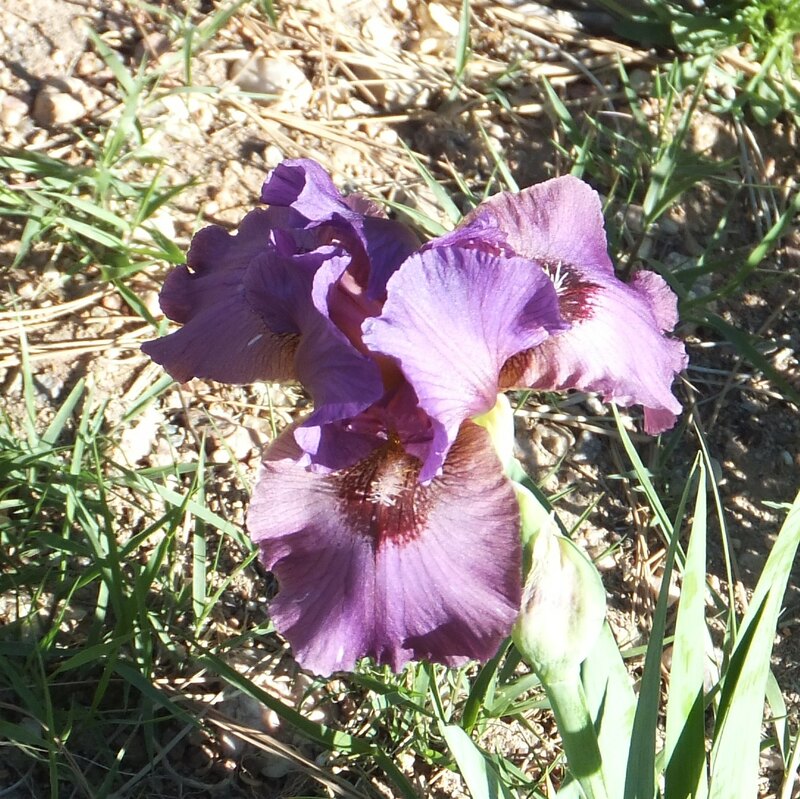 Most arilbred medians are sterile, but there are a few fertile ones from unusual breeding approaches. 'Aladdin's Gem' (Thoolen, 2002) has only Iris pumila and pure arils in its ancestry - no TB heritage at all! 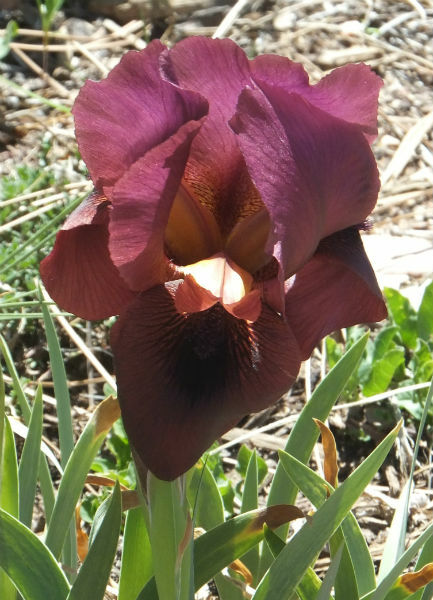 Likewise, 'Anacrusis' (Mathes, 1992) is derived from pure arils and the dwarf bearded species Iris suaveolens. 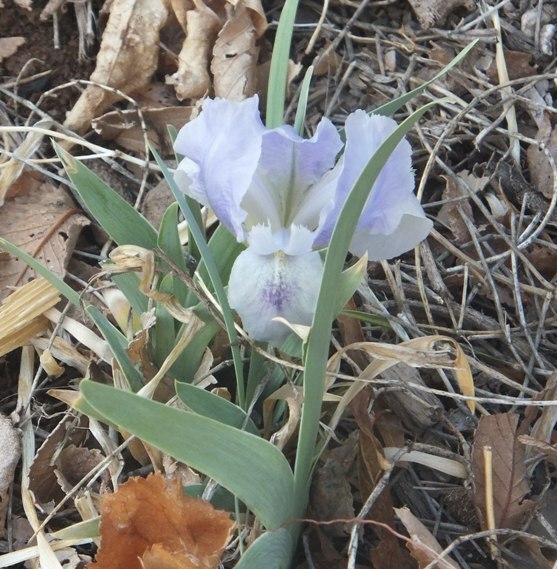 It has a number of worthy descendants, including the striking and popular 'Concerto Grosso' (Mathes, 1998), which won the C. G. White Medal in 2005. 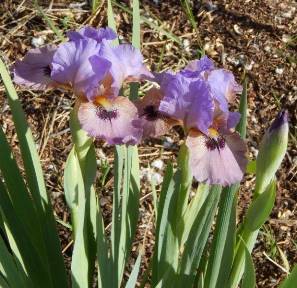 Have you tried any arilbred medians in your own garden? How do they do in your climate?